Rings to dazzle, rings to charm, rings of all sizes, rings of all shapes, rings for all fingers and rings for all tastes. Fabricate all manner of rings: stone rings, hollow rings, ladies rings, men's rings, wedding rings, bishop’s rings, lover's rings, friendship rings, engagement rings, magic rings, big rings, little rings, bold rings, simple rings. ‘RINGS! RINGS! RINGS!’ Flex your creative muscles and let your imagination soar. Come explore the many aspects of ring design. Innovation, originality and individuality will be our primary goals, with lots of technical tips, how-to's and bench tricks thrown in along the way for good measure. 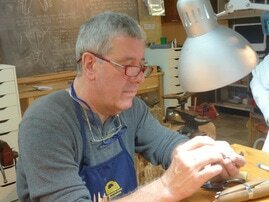 Competent basic jewelry making and soldering skills required.